Blackpool Central was the largest railway station in the town of Blackpool It is long gone, and principal railway services to Blackpool now terminate at Blackpool North station. The station was opened on 6th April 1863 as “Hounds Hill” and was not actually renamed “Blackpool Central” until 1878. Initially, it was a relatively small town centre terminus for an isolated line running along the south Fylde coast from Lytham. In 1874 this line was connected to the one running from Lytham to Kirkham allowing through trains from Preston and beyond. In 1901, the station was enlarged to include 14 platforms – the same number of platforms as London’s busy Paddington terminus operates in 2006. A further development came in 1903 when an additional railway line was added, routed directly from Preston and considerably shorter and quicker. This arrangement made for very convenient and direct access to Blackpool’s town centre, particularly the sea front and Blackpool Tower. Central Station was the focus of Blackpool’s worst incident during World War II. Blackpool was home base for a major flight training centre and a fighter squadron during the war. On 27th August 1941, two aircraft – a Blackburn Botha trainer and a Boulton Paul Defiant fighter collided in midair over the sea, just off Blackpool’s central seafront. The debris from the collision was strewn over a large area but a large part of it struck Central Station, causing severe damage and killing several people, the exact number is unknown to this day. The station remained in service just long enough to see its centenary before sudden closure on 2nd November 1964 as a consequence of the Beeching Axe. Part of the building was used as a bingo hall until 1973, at which point all buildings were demolished. The direct line from Preston (which also passed through Blackpool South station) was closed in 1967 leaving a large tract of wasteland along with disused embankments and bridges. The land reclaimed from the station buildings became the location of some sea front amusement arcades, a new police station and a multi-storey car park with some residual spare land used as additional flat car parking space. In the late 1980s, the derelict track bed of the central railway line was adapted into a road connecting the town centre with the M55 motorway. This road terminates at Blackpool Central Car Park, based at the site of the former station office. The main claim to fame for this area is that Blackpool Illuminations are ceremonially switched on here with a large party and often local and national radio coverage. The very outer wall of the car park is the last visible remnant of the 1900 build. Blackpool North railway station is the terminus of the Blackpool branch line from Preston. Services from East Lancashire, Liverpool and Manchester terminate here. The station is a large 1960s concrete block, with many redundant and barely used platforms. As Blackpool is a popular tourist resort, with its famous Pleasure Beach and beaches, the security to ensure all passengers pay is quite high: no passengers are allowed to board trains without being checked by guards. The station is some distance from the Blackpool tramway. Former franchise holder First North Western ran services from Blackpool to London Euston, but these were soon discontinued. The resort’s sister station, Blackpool South is further down the Golden Mile. The station was formerly known as Talbot Road. It consisted of two parallel trainsheds, a terminal building and open “excursion” platforms (used only in summer), totalling 15 platforms in all. In the 1970s the main station was demolished, replaced by the current station based on the former excursion platforms. Blackpool South railway station is a single platform stop at the end of the Fylde coast branch line from Kirkham and Wesham. It is unmanned and has only limited services along its route. 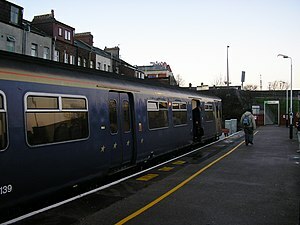 The station serves the suburban south of the tourist town of Blackpool and is currently only served by trains running through Preston into East Lancashire and terminating at Colne, with occasional runs to Clitheroe. In the past this was a busy station. The direct rail line from Kirkham came in here – the track bed is now the road called Yeadon Way. The line extended north from here to BlackpoolCentral. There were extensive sidings to accommodate the many excursion trains which came to Blackpool.